You figure it out...and yes that is leopard print carpet. So, I don’t want us to get off on the wrong foot here. I mean, I’m a good dad. I’ve got a clean record with the police station. Sort of. It’s just that every now and then, I get distracted. (Once again Steph, you’re right…) I disappeared from the living room for a split second and I may have missed the youngest acrobatic trick ever performed. I’m perplexed and still wondering how it happened. The Worm is only 9.35 months old. He just started crawling this past Christmas day as a gift to us! Yes, I know…so cute and adorable as long as you’ve got a leash securing him safely to a post. Managing Gavin used to be a piece of cake, you know. Just lay him down to drink his milk and I go play on the computer for 30 minutes. Of course, I would always keep my ears peeled for that air-sucking noise from the empty bottle and return to find all’s well and baby is satiated. Ok, so knowing (or still believing) that the Worm can’t get off the couch, I follow my couch feeding routine. Stuff Gavin between couch cushions (every dad knows this trick) with a bottle and let him go to town. I leave towards the kitchen for literally 2 seconds (or a couple more, but hey, who’s counting?) and I hear a little THUD. I go back to the living room and see the Worm on all fours smiling up at me from the ground. 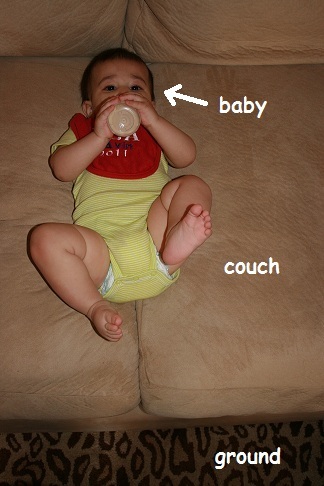 The milk bottle is still on the couch nicely tucked between the cushions which previously held a little body. Now, mind you…the kid can barely stand on his own two feet, let alone jump from the couch. He just started crawling a couple weeks ago! So, I had to exercise my brain a bit to figure this one out. Using my engineering mind, I realized that the spacing between the couch and the coffee table is about 18 inches. He obviously didn’t hit the coffee table on his way down. Also, there is enough altitude between the couch and the ground (about 20 inches) for Gavin to complete the 540 degree somersault necessary to stick the landing. As long as he tucked his limbs in properly. Which of course, he must have. Bela Karolyi, if you’re reading this, I think we have found the next Paul Hamm.